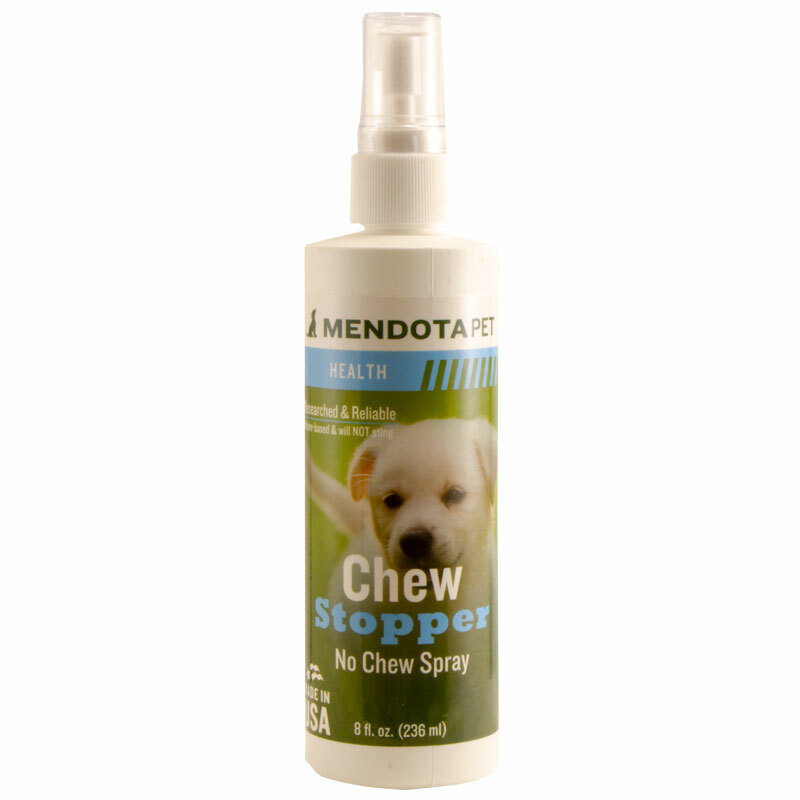 Chew Stopper by Mendota Pet. $9.99. It did not seem to have the effect that I was expecting from the ads. It did however slow down some of the chewing but my pup seems to tolerate it. Has not eliminated chewing on her kennel. Mendota Pet Chew Stopper is an easy to apply spray that will stop dogs from chewing and gnawing on valuable items. Inexpensive and non-staining, Chew Stopper can be used on any washable surface, indoors and outdoors. It is water-based so it can be applied to wounds or bandages unlike alcohol-based products which cause stinging. Spray Chew Stopper evenly on shoes, boots, wounds, duck calls, summer itch, furniture, and anything else he or she should not be chewing. Use Chew Stopper regularly until the unwanted chewing is cured. Safely stops your dog from chewing -- tastes terrible but works great! 8 fl. oz. per bottle.